Annually, Association of Ayurvedic Professionals of North America (www.aapna.org) awards the best scientists, doctors and social activists, who significantly contribute to the development of Ayurveda in the world. 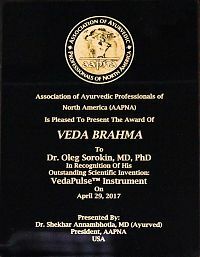 This year, the award went to several people and one of them is the Managing Director of National Ayurvedic Medical Association of Russia, developer of VedaPulse™ - Dr. Oleg Sorokin (MD, PhD, specialist in the field of Ayurveda, pulse analysis and clinical herbal therapy), who received the award in nomination “Veda Brahma”. - Small bugs have been fixed in the software. Hands-on workshops with VedaPulse worldwide! Every year our partners from different countries organize educational seminars where we give lectures for the VedaPulse users and everyone who is interested in our technology. During the first months of the Fall we had educational seminars and workshops in Birstein (Germany), Milan (Italy), Harderwijk (Netherlands), Padua (Italy). Every lecture was unique in its audience and its contents. The next step of our scientific European trip was the 3rd International Ayurveda Congress in Milan, Italy. The Congress was organized by one of the oldest Ayurveda associations in Europe – Ayurvedic Point – founder of which is our friend and renowned expert – Dr. Antonio Morandi. This trip was packing a pool of important meetings for us and we will tell you about them in this article. history of convergence between provable medicine and Ayurveda. In September, our team has done a great scientific tour through Europe. The first point of our trip – was the 18th International Symposium on Ayurveda - 2016, which is annually held by the European Academy of Ayurveda.